Living in the beautiful Orange County in the city of Orange. Currently living in an apartment down the street from the Angels stadium. I have lived here for about 2 years now with my husband and this is our home. My husband and I are great fans of different street art/contemporary art, so we have decorated our home with two famous Banksy portraits. 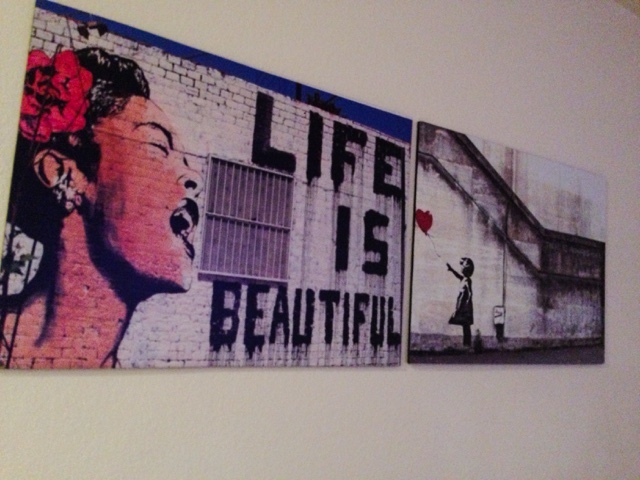 I love these two portraits because they are meaningful and gives our home a grungy modern feel with this street art. Art is always a must it gives your home character. I would actually love to see Banksy's street art in person. Who knows maybe we will go on a hunt to the big NYC and come across with his art. Now, that is a pending blog, haha. Ciao for now.